In the very first episode of Speaking With The Dead SB10K has brought the creator and lead artist of Xeno Guardian Red Visor Go (an independent sentai style comic that you should go pick up immediately) as well as one of the hosts of the SodaPopComicsCast (which you should all go listen to) into the lab. A long interview consisting of comics talk, inspirations, pop references and so very much Digimon ensues. Come join our newest member the SB10K as he goes sailing down the river into the Heart of Darkness. This episode it’s the Francis Ford Coppola classic Apocalypse Now. After a day filled with momentary mourning, discussions over proper tools and more squirrel bites and electrical burns than we care to admit we at the Dead In Decatur team are proud to announce our newest member! It is with a heavy heart that we at Dead In Decatur must announce a great loss. 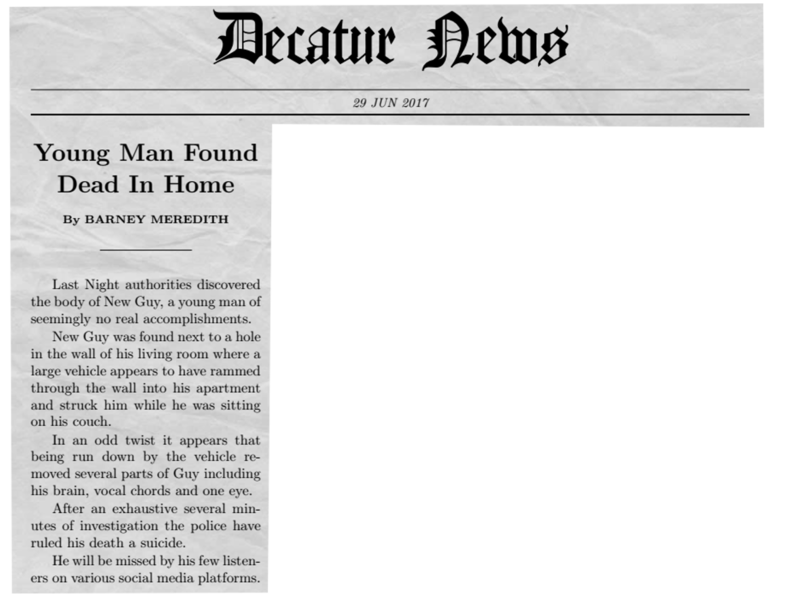 The following is a clipping taken from a local newspaper. This of course is a terrible tragedy…all of that potential podcasting content wasted. In light of this we at DiD must announce the immediate cancellation of “Just Look At It In the Near Future” and the “Chop Shop.” We are aware that this will be a mild inconvenience to his five or six listeners and we will do everything in our power to ensure quality content like “Just View It Sometime” going forward.